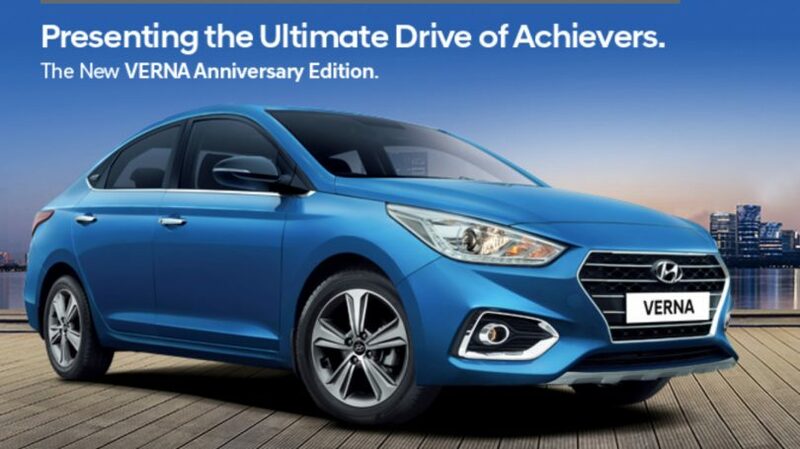 Hyundai has launched the Anniversary Edition of the Verna sedan in India. The brand is also celebrating 20 successful years of operations in the country, and the Verna plays an important role in the sales journey where it rivals the likes of Honda City & Maruti Suzuki Ciaz. The Verna anniversary edition gets a good looking sky blue paint scheme. On the inside, this Verna anniversary edition which is based on the top trim of the car gets all-black interiors. Equipment additions on this version include rear spoiler, contrast black ORVMs, wireless charging, faux brushed aluminium skid plates at the front and rear, blue accents on the inside and anniversary edition badge and a black sharkfin antenna. Additional benefits on the Verna anniversary edition includes INR 20,000 exchange bonus and other add-ons. Pricing for the Verna Anniversary Edition starts at INR 11.7 lakh for petrol MT, INR 12.83 lakh for petrol AT and INR 13.03 lakh for the diesel MT (ex-showroom prices).